An older, wiser, mellower Bill Gates has publicly acknowledged that his younger self probably engaged in some behavior at Microsoft that was over the top. He did some soul-searching in the annual letter he published with his wife, Melinda on Tuesday. This realization came after Gates spent some time with a teen anger management group that is having great success at keeping at-risk kids out of trouble. Bill Gates has always been one of the tech industry’s brightest minds. But decades before he was known as a benevolent, beloved philanthropist, he had earned a reputation as the brilliant young jerk at Microsoft’s helm. Today’s older, wiser, mellower Gates gave a head-nod to his younger self during the annual letter he published with his wife, Melinda on Tuesday. In the letter, Gates discussed a touching encounter he had with a teen anger management group called Becoming a Man (BAM). It happened after he and Melinda spent an an afternoon at a Georgia state prison, trying to learn more about the link between poverty and incarceration. The inmates they met described themselves as basically good people who made terrible decisions in the heat of a moment. BAM is an organization that supports at-risk youth, teaching them how to get through their difficulties without ruining their lives forever. BAM has "drawn a lot of attention for its success: A study by the University of Chicago found that BAM reduces its participants’ violent crime arrests by almost half," Melinda Gates writes. So Bill went to a BAM meeting and instead of just observing, he participated. "I had no idea how moving it would be," he wrote. The boys talked about the things that made them angry — from typical teenage frustrations with a teacher, to the trauma of having a friend who’d been shot. 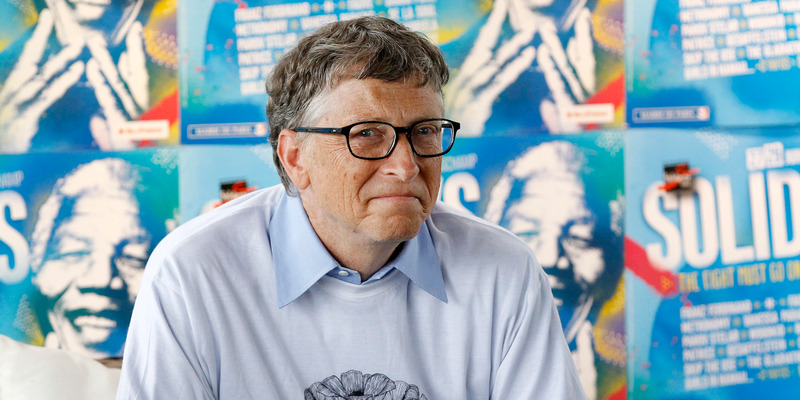 When it was Gates’ turn to share, he confessed to getting angry at the fact that there are an increasing number of polio cases, when his foundation had helped to almost eradicate that disease. But he says, the experience caused him to do a little soul searching, too, on what he was like when he was younger. "Growing up, if I thought my parents were being unfair, I could be pretty harsh with them. When I was at Microsoft, I was tough on people I worked with. Some of it helped us be successful, but I’m sure some of it was over the top," he admitted. In fact, Gates had quite the reputation as a terror back in the day. He was known to get into shouting matches with rivals, and to yell or use condescending language with employees at meetings. In a 2011 interview with 60 Minutes, Microsoft cofounder Paul Allen described his relationship with Gates in those days in hellish terms. That’s all water under the bridge. Today Gates is revered by his 1,500 employees his foundation, not to mention the 135,000 current Microsoft employees. "Learning to deal with your anger was something we all related to. It’s an important life skill, part of becoming a mature adult," he says in the letter.